If you are not a Collectors Society member the time has finally come when you can order your Replica Darth Vader Helmet! An exact replica of the helmet worn by Hayden Christensen every detail is there, right down to the padding inside the helmet!! The Signature Edition is limited to just 500 pieces and is signed by both Hayden Christensen and James Earl Jones! Head on over to Master Replicas to place your order before this historic piece is sold out! 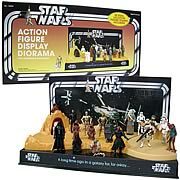 Entertainment Earth has in the way cool and way retro Pride Display Star Wars Diorama !! These great new display stands bring back the look and feel of those great display stands and playsets from the good old days and wraps then all into one fantastic display piece!! Head on over to Entertainment Earth and order yours now!! If you downed the articles about the FACTS 2003 convention and liked them, you'll be happy to know that the �sequel� is now up as well in our Star Wars Experience Section. In a year�s time, a lot changed about the convention itself and for the people visiting it and treating you to the account of their journey. �More, bigger, better� would be a good summary of the evolution, but why not go read it all for yourself and enjoy the party as if you were there? Just follow the link � FACTS 2004; Real Shaggy and Iradonian strike again. JTA welcomes Podcasts to the web hosted by Arnie & Marjorie C! What's a Podcast you ask...read below and check it out! The newest Star Wars related podcast on the web -- Star Wars Action News. This is the first podcast dedicated specifically to Star Wars Collecting, with special focus on the Hasbro and Kenner action figures, hosted by Arnie & Marjorie C, a husband and wife collecting team in Springfield, IL. Episode 1 of this podcast is available now right here! We are in the process of getting added to iTunes and other podcast directories, but would appreciate any feedback you can offer on our new Podcast. Obi-Wan Kenobi with his Red Leader head gear and cool Jedi cloak have been added to the Revenge of the Sith Visual Guide today. Obi also sports articulation like you have never seen in an Obi-Wan figure before so the is one figure that must be picked up without a doubt!! And, in a double dose of ROTS action today the Mustafar Sentry also joins the ranks of his fellow ROTS buddies of plastic. He sports a cool new flame base and a "spinning" energy bolt. Don't forget to stop by Alliance Collectibles for these great figures and a whole lot more! With only one more day left in the August contest, Stephen Davison is now entered to win the Kenny Baker autograph. You still have time to send your collection to collections@jeditemplearchives to be entered in the drawing! Hurry! The deadline is midnight EST August 31st! Today's update over at Hasbro focuses on the Battle Packs. Read all about and see info on the Jedi vs. Separatists, Rebel vs. Empire, Jedi Temple Assault (K-Mart), Imperial Throne Room (K-Mart) and the Assault on Hoth (TRU) Battle Packs! To top it off, they have also posted images of the Clone Attack on Coruscant which is slated to be a Target exclusive and will have Commander Bacara and four Clone Troopers! And all the clones have new paint applications! Check out the article by clicking on the image below! If you aren't following David Guivant and his L-Cheapo film crew just yet, then we would like you very much to add his site to your list of daily visited places on the net. Why? That�s very simple. David and crew are the talented makers of Star Wars fan films and after their first movie �George Lucas; Legends of the Force�, which was screened at the Grand Rex theatre during the Star Wars Reunion convention last spring in Paris (France), everybody is now yearning for the release of their second instalment, �Prime of the Jedi�. So head on over to the Guivant site and start transferring those bytes! Two more POTF2 exclusives go into the guides, this time it's Kabe and Muftak. These were exciting figures for their time, being some of the first new cantina figures to reach fans. Check out the exclusives guide to see all kinds of Star Wars exclusives, enough to keep a collector (and his pocketbook) busy for quite sometime! The Official Site has revealed the look of the new 2006 Package Art! Still featuring the ominous mask of Darth Vader the rest of the package moves off planet and we see Mustafar from a distance with the Star Wars logo returning to its silver roots. Click below to take a closer look at the cool new design. Word is out that the Revenge of the Sith DVD will be released on DVD only. Read the whole story over at Video Business.com! Mark Luff of Ontario Canada is now entered in August's contest! Only two more days to get yourself entered into the contest to win an autographed photograph signed by Kenny Baker. Send yours in to collections@jeditemplearchives! It doesn't have to be posted by August 31, but it does have to be submitted to our mailbox by the 31st. Covert Ops Clone Trooper at SWS.com! The Star Wars Shop has the Exclusive Covert Ops Clone Trooper Action Figure up for pre-order at $13.99 a piece. This figure debuts a new line of troopers being released by Hasbro in the coming months! In addition, the figure comes packaged on a special backer card sporting the Episode III DVD logo and art -- one of only a few Hasbro products that will feature this compelling look. The limit is just 5 per person but this guy is sure to sell fast! Click here and order yours now!! Another Gentle Giant mini-bust exclusive has been added to the Visual Guides today. The Chrome Stormtrooper was offered up by the Star Wars Shop late last fall and was limited to just 2,500 pieces! Check it out in the Gentle Giant Visual Guide or by clicking the thumbnail below!! Peter Mantzioros from Quebec sent in his collection to share with everyone today! Check out the images by clicking right here! If you want a chance to be entered into this month's contest for a Kenny Baker autograph on a ROTS photo just for sending in your collection don't forget you only have three days left!! Send it in to collections@jeditemplearchives.com before it is too late!! More additions to our exclusives guide, this time filling in a few holes from some cool exclusives from the 90's. Before Mace Windu got his one-of-a-kind purple lightsaber, he sported a normal, blue lightsaber. Check out the very first prequel figure to be released by clicking below. You can also see the very cool mailaway certificate you needed to order this figure, back when the UPC proofs of purchase on the backs of figures actually MEANT something! Also on tap, the very green Oola, with Jabba's sidekick Salacious Crumb. This 2-pack was a Star Wars Insider exclusive. These two 2-packs were among the first mailaways to offer unique packaging, unlike all earlier mail-aways which came in generic white boxes. August's contest is nearly over! Tim Enloe has gotten himself entered to win a free autograph from Kenny Baker on an awesome ROTS color photo by sending us his collection to be featured in our collector's room. Send your collection to collections@jeditemplearchives! Hurry! You only have 4 more days to get yourself entered to win! Hey, it's free to enter and free if you win! What do you have to lose!? Visual Guide Update - M-Pire! Some more of the 2 (and 3) packs for the Chocolate M-Pire figures have been added to their Visual Guide section today...a few Sith in the likes of Darth Maul and Count Dooku join the VG ranks along with Queen Amidala and her faithful astromech R2-D2 and his buddy C-3PO! Click below for a closer look! Honestly, there are enough cool items at great prices in this Entertainment Earth Summer Blowout sale to take a trip to see what they have. If you ever wanted an Attakus statue or a Rawcliffe Pewter figurine they've got some outstanding prices on some really nice pieces...not to mention all the other Star Wars goodies they have. Check out the sale before what's left is sold out! Didn't vote yet? Do it right here! The highly anticipated Early Bird Kit should be arriving in the coming months, so we thought this would be a great time to add the mail-away certificate to our exclusives visual guide. You can check out all of the components that came with this certificate package, along with a highly detailed PDF featuring the main paperwork from the kit. Click below for the packages contents, and click here to take a closer, more detailed look at the documentation in PDF format. The latest Hasbro update focuses on the new Titanium Ultra line...the cool larger scale ships in the series. The line will take off in 2006 with 2 Wal*Mart exclusives the X-Wing and then the Republic Gunship. From there it will move on to other retailers as well! Click here to read and see more! The latest installment of the Research Droids Reviews is hot off the presses and focuses on Revenge of the Sith figure #54 - the AT-RT Driver. Do you want to know how does this guy stands up to the rest of his clone brothers? Click here to read on and see if he passed his Kaminoian training with flying colors. Hasbro seems to finally be jumping on the update wagon once again and today they present the 2nd Wal*Mart Collector Set in the Titanium Series. The set includes Boba Fett's Slave I and X-wing, repaints of the ARC-170, Clone Swamp Speeder and an exclusive silver TIE Bomber...but you knew that already because you keep that JTA ROTS Checklist handy! Take a closer look by clicking below. Time to start "building" the Revenge of the Sith LEGO section! Today we are adding set #7251 Darth Vader Transformation to the LEGO Visual Guide. The set features mangled Darth Vader (he's not really Anakin any more is he?) and suited up Darth Vader with removable helmet mini figs and an operating table that turns to reveal the new rebuilt Dark Lord of the Sith. Check out the images below! Toy Fellas is having a 7-Day Discount Sale now until August 30th. Save big on all orders with the discounts below. Take 7% off all order any order total. Finally Take 25% off all order $95.00 or more. Just add item to shopping cart & discounts will be automatically calculated for you. We have many items new items in stock now from Star Wars to Family Guy. Have a good look around!! Andrew's Toyz has just received a bunch of great new stuff in and it is waiting to ship to you right now! 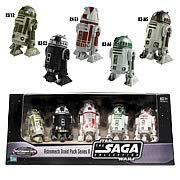 The fantastic Code 3 A New Hope Style D Legendary Cast is in stock now and ready to ship! This is one amazing piece, and absolute must-have for any collection. When you drop in don't forget to pick up a few of the Green Clone Commanders and this is your place to buy the Master Replicas mini-saber stand at a reduced price! Stop in Andrew's Toyz today! ** UPDATE ** New supplies of the Post-OTC Sandtrooper just arrived. Order yours now before they sell out once again! Another Master Replicas exclusive is added to our exclusives guide. This time, it's the 2004 scaled lightsaber convention exclusive, the silver version of the Obi-Wan Kenobi gold saber that was offered as a Collectors Society exclusive. It is the same in every way, but is not gold plated. You can see the silver version below, and for reference and comparison i've also posted the gold version. Code 3 Collectibles has added two more mini sculpted movie poster to their Star Wars line. The Return of the Jedi and The Revenge of the Sith posters only cost $24.95 each and would be great additions to any collection! Check them out by clicking below! The Master Replica's 2005 Collector's Society membership kits have been rolling in and with them is a scaled replica of Darth Maul's lightsaber...before Obi-Wan took care of it anyway. Along with the kit is a patch, newsletter and explanation of benefits. Membership cards are being sent out separately. Check out the images in the Master Replicas section of the Exclusives Guide. Remember that this piece is only available from the Master Replicas Collector's Society so if you have not joined yet (and why haven't you?) just click here and you'll be on your way! So, you like the Kotobukiya Shock Trooper and were wondering how to get to Japan to get one? No problem, the Star Wars Shop has you covered! They have a limited supply of the only 1,000 that will be made worldwide, so head on over right now before they are all gone!! Brianstoys.com announces that they have the Master Replicas Darth Vader ESB F/X and Anakin F/X in stock, ROTS Deluxe Figures, Clone Trooper 3-Pack, AFA Vintage Loose and more! Head on over to Brian's Toys today! Our pals over at Rebel Scum have uncovered a list of items that will be showing up at your local Target this fall...wanna know what to save up for? Check it out right here! The Official Site has some images and details about the new LEGO Slave I that will be released this January. It sports a ton more pieces, is truer to the shape of the ship and comes with IG-88 and Dengar! Click the thumbnails below for a closer look and all the details! Our Collectors room gets another update, this time Josiah Torrez from Texas sends us his collection. Josiah is also automatically entered in August's contest for a chance to win a signed Kenny Baker autograph. There's only 9 more days to get your collection submitted to be eligible, so send us your pictures ASAP! OK, so you've got all the figures in the ROTS line and your armies are greater than that of the Republic but...they are all in a pile because they keep falling over when you line them all up just so. Stop by Real Stands today and order a bunch of stands for those armies! Shop today and you can save up to 50% on your entire order! Stop by Real Stands today! The first of the Gentle Giant dioramas, the mighty Dewback with his Sandtrooper rider, has been added to the Gentle Giant Visual Guide tonight. This highly unique and super detailed piece is a must have for all collectors. Just take a look at the detailing in the sand...footprints, swipes from the tail and every grain of sand can be seen! Check it out by clicking on the images below! Don't forget to stop by Andrew's Toyz for all your Gentle Giant needs! Vote for the 1st Sidehow 12" Figure! Sideshow Collectibles is giving you the chance to vote for the very first figure in their 12" line. With a choice between Kir Kanos, Grand Admiral Thrawn, Mara Jade, Padm� (arctic suit), Asajj Ventress and Quinlan Vos it won't be an easy choice at all. Click here to make your voice heard! ToyJoe.com has sent us in some images of some cool Collector Packs that can be found at Disney! Each pack has random figurines and the more you buy the better chance of having a complete set! Check out the images below! One of the few remaining Hasbro 12 inch figures has been added to the ROTS visual guide. Check out the evil sith lord for yourself, and don't for get to check out Alliance Collectibles for tons of Sith related merchendise! ACPin sends word of their latest Lego dioramas. Click the pictures to view each custom-built Lego scene! Here's the first two dioramas from a new series about the Podraces in TPM and the Droid Gunship from ROTS. Throughout the Mos Espa speedway, checkpoint towers are manned to observe and report the progresss of the race to the viewers at the Grand Arena. Numerous crashes and accidents that occur during the race are caused more often by the drivers themselves rather than the swirling sands which clog the engines. During the Boonta Eve Classic, the family and friends of some privileged racers watch the race from the viewing towers built in various areas inside the grand arena. The Confederacy developed this dish-shaped droid gunship in response to the victories won by the powerful Republic attack gunship during the Clone Wars. These droid gunships were deployed at such engagements as the Battle of Kashyyyk. Another cool bounty hunter makes it's way into the Gentle Giant visual guide. This time it is IG-88, the mechanical bounty hunter. This is a very detailed mini-bust that will look great on your shelf next to Bossk, Boba Fett, and Boushh! Head over to Andrew's Toyz to check out their nice selection of Gentle Giant items! We have some new exciting items from Hasbro & Gentle Giant Studios In Stock! Darth Tater Mr. Potato Head Only $19.00. The package comes with lots of silly parts, including lightsaber, cape, helmet, shoes, eyes, nose, teeth and more! STAR WARS ROTS DELUXE BACK IN STOCK! Today we are rounding out the first 2 waves of Target Cup and Figure sets with the addition of the Clone Trooper and General Grievous to the ROTS Visual Guide. While the Clone may be a repack of the Episode III-6 clone, and Grievous from the preview wave, the cups are must haves and will look great next to those old Burger King glasses. Check them out below! Our friends over at www.starconstrux.de send us their latest custom creations, along with info about their newly re-designed site! Check out all the latest dioramas and custom ROTJ figures by clicking below! The first newly sculpted clone to be added to the guides in a while, the new and improved AT-RT driver is another cool addition to the clone masses. While his weapons leave something to be desired (POTF2 rings a bell), the clone himself is pretty cool. Ditch those bulky weapons and throw one of your extra clone commander's guns in his hands and he'll fit right in! Brianstoys.com sends us their latest newsletter, chock full of hard to find figures, including enough clones to satisfy even the Emperor! Check out the whole newsletter at Brianstoys! Another clone varient makes it's way into the ROTS visual guide. This time its the green version of the Clone Commander. Maybe not quite as cool as the new shock trooper, but another must-have clone to add to the ever growing army of clones! Keep an eye out this week for the release of more clones, including the new varients. They are popping up in stores more and more these days, so we thought this would be a great time to introduce them into the ROTS visual guide. We'll start things off with the shock trooper repaint of the Episode III-6 clone. This is one awesome repaint! If you don't have this one yet, check it out below to convince yourself to pick it up the first chance you get! Tonights addition to the collector's room is Mike Simmonds of Canada. Check out his collection by clicking below. Don't forget, our contest deadline is August 31, so have your collection submitted to be automatically entered! With the long awaited release of the 4th wave of the Star Tours line, we thought now would be a good a time as any to catch up a bit. Today we have added the 2nd wave of the line to the Star Tours section of the Special Exclusives Visual Guide. The droids in this line are DL-X2, R4-M9 and WEG-1618. Click the thumbanilas below to take a closer look! Collector's Room Update � Darren G.
Well, Darren got in his entry in for this months contest for an autographed Kenny Baker ROTS photo! But we are luckier than he is because you can check out his super cool diorama style displays! Darren likes to spice up his shelving with his own creations that focus on different scenes from the Saga. Click here to see Darren's collection and if you want to enter this months contest, don't forget to send your in to collections@jeditemplearchives.com!! The 3rd and final part of the Anakin Skywalker to Darth Vader Evolutions set has been posted in the Research Droids Reviews today. Focusing on the Dark Lord of the Sith himself this is the icing on the cake. Hop on over and read the review and the overall thought on the entire set! If you have a suggestion for a review or just have some general comments send an e-mail in to sal@jeditemplearchives.com! Today the 3rd of four 4-packs of the EE Clones have been added to the OTC Visual Guide. These Clean Officers for some reason like to remain off the battlefield...not very clone like, but they look cool either way! Check them out by clicking below! Alliance Collectibles has some brand new specials up for Jedi Temple Archives readers! They have an awesome set of 12 ROTS Collection 2 figures, the Leia in Boushh Disguise mini-bust for just $42.99, 500th Darth Vader ($16.99) and the Gentle Giant Darth Vader Statue for only $174.99! The only way you can get these prices is on the JTA page so click on over to take advantage of these great deals while supplies last! By now you have heard the sad news about Katie Johnson, daughter of 501st founder Albin Johnson, passing away. If you made donations through Sandtroopers please e-mail them so they with the dollar amount so I can verify this with the Heart of the Empire.org crew. Once again our prayers go out to the Johnson family. Also, don't forget that Sandtroopers is running their 5th birthday contest...stop on by and be sure to enter to claim one of the daily prizes! Action HQ has a fantastic deal right now for you Kotobukiya fans...the Darth Maul is on sale at a super deep discount for only $45!! This offer is only good until August 25 or when supplies run out! Our Gentle Giant visual guide gets another update with the newly released Princess Leia in Boushh Disguise. Another extremely well done sculpt of a very cool bounty hunter (and princess). Check out the new mini-bust below, and head over to Andrew's Toyz for some very good pricing on Gentle Giant items. Andrew's Toyz is our official sponsor of Gentle Giant products, so they are sure to carry all the new items as they are released! Part II of the Anakin Skywalker to Darth Vader Evolutions set has been posted in the Research Droids Reviews today...if the 1st part did not convince you that this is one worth set, then the second part sure will! Click here to read all about the Revenge of the Sith version of Anakin! Real Action Heroes at SWS! The StarWarsShop has the awesome, super-articulated Real Action Heroes in stock now! Darth Vader features 24 points of articulation and even sports 6 glove variations so you can put him in all sorts of poses! Luke is 12" tall and also has 24 points of articulation...and the details on both are outstanding! Click below to order yours today! While there, don't forget to check out the Star Wars Shop's great selection of Disney Star Wars weekend merchandise too! Gentle Giant did the initial sculpt, but this is a Lucasfilm Product. Made for the folks in the office, the Star Wars Shop was able to get a hold of a bunch of them and put them up for sale to the general public. The maquette is a 3-D depiction of the artwork from the front of the video game and boy is it cool looking! Limited to just 400 world wide your best chance of seeing one is right here in the Gentle Giant Visual Guide! Part one of a series of 3 reviews about the Anakin Skywalker to Darth Vader Evolutions set has been posted in the Research Droids Reviews! I wasn't too sure about getting this set in the Evolutions line but I am extremely happy I changed my mind. Want to know why? Click here to read all about the Attack of the Clones version of Anakin! If you have any suggestions for the Reviews column feel free to e-mail me at sal@jeditemplearchives.com or PM me. What? But Comic Con was weeks ago...yeah, well, you're right, but it takes time to make a quality Visual Guide. The 2005 SDCC has been updated with the Master Replicas Exclusive Chrome Yoda scaled lightsaber and the Acme Archives General Grievous Character Key. In addition the Holo Leia has been added to the OTC Visual Guides too! Click the images below, or take another look at the 2005 SDCC to take a look at the guides and all the rest of the coverage one more memorable time. Our collector's room updates continue, with another forum member's collection: Doug Fulford. Doug has not only contributed to our collections page, but he's also provided many pictures for several of our vintage visual guides, including all of the pictures in the vintage foriegn guide. Doug can be found in our forums under the name Lord_Stitch, and is heavily active in the vintage and customs sections. Check out Doug's collection by clicking the thumbnails below, and send your collection to collections@jeditemplearchives.com to get yourself entered into this months contest for a free autograph from Kenny Baker, on a very cool ROTS color photo. Hello from Toy Fellas!! New In Stock! Gentle Giant Studios Han Solo Mini Bust only $42.99 Stands 6.5" tall. We will only be receiving 8 of the Han Solo Mini Bust be sure not to miss out. Our Leia Mini Bust sold out in 1 Day. 500 figures later.... Check out the Revenge of the Sith Visual Guide, as we introduce the hightly anticipated Darth Vader 500 figure exclusive. Coming with a very cool and detailed meditation chamber, this is yet another awesome Darth Vader sculpt. If you haven't had a chance to pick this up yet, check out the guides below to see what you are missing! It's time to add another staff collection to our collector's room. This time it's Mike Heicken, also known in the forums as mikeskywalker1969. Mike has a very impressive collection, including some very cool custom displays. I've seen it first hand and the pictures don't do it justice! Don't forget to send in your collection to get entered into this months contest for a chance to win an autograph photo from the autograph bounty hunter. Sorry Mike, staff are not eligible! If it's customs you are into, don't forget to check out the customs section in the forums, Mike has alot of his stuff there as well. Click through to learn who will be present and for more detailed information! Visual Guide Update - Battlepacks! The Jedi vs. Sith Battlepack has been added to the Revenge of the Sith Visual Guide. This set includes 3 news sculpts of Anakin Skywalker, Asajj Ventress and an Obi-Wan Kenobi that comes with snap on Clone armor! Yoda and General Grievous (I didn't know he was a Sith...) round out the multi-pack. Check out the images below or head on over to the Battlepack section of the ROTS Guide to take a closer look! The first of 3 evolutions sets are officially added to JTA! Keep an eye out in the coming weeks as we roll these out! The first set, Anakin Skywalker to Darth Vader, is now featured in the Revenge of the Sith visual guide. This is by far one of the nicest multipack sets Hasbro has produced! If the other evolution sets are as good as this one then we are in for a treat! Check all of the details out below! Our good buddies over at Sandtroopers.com had a chance to get up close and personal with Steve Sansweet this weekend at Wizard World Chicago. From collectibles to TV and the fate of CIV, check out the whole interview right here. Are you interested in sniffing the atmosphere of a European Star Wars convention? If you are, you will certainly want to open up our Star Wars Experience section once more today, because we have added some articles on the 2003 edition of the FACTS Convention to our pages that were previously featured on BeJedi.com! This year will know the 15th edition already of FACTS and as it befits a good international site, JTA will follow-up on the event closely, so stay tuned for updates and reports! Practical information on the convention you can find on www.facts-convention.com. Brianstoys.com announces that ROTS Anakin Battle Damaged is back in stock along with the cool new Tomy Mini Helmets! Looking to beef up the ROTS collection? Tons of ROTS 3 3/4" are back in stock along with dozens of vintage carded & 2005 G.I. Joe now in stock! The first of 2 Titanium Gift Packs can now be found at your local Wal*Mart and today we've added images of it to the Titanium Section of the ROTS Visual Guide. This set includes Anakin's Jedi Starfighter and the Droid Tri-Fighter which were released in an earlier wave, but, you also get a Republic Gunship with green markings, Obi-Wan's Jedi STarfighter and an exclusive raw metal AT-RT. Check them out by clicking the images below! So begins the clone variations... Hasbro is taking full advantage of the clones by releasing many variations from thier first batch. This one, the black pilot, is a very cool addition. Although not actually in the movie, it is a nice figure that bridges the gap between the Revenge of the Sith pilot and the pilots we see in A New Hope. You can check out the full Revenge of the Sith Visual Guide for yourself, and keep an eye out in the coming weeks as we introduce some of the other clone clones! ProTech StarCase III for ROTS figures is back in stock, starting as low as $1.48 each. ROTS figures #54-56 have arrived along with the Japanese Edition #50 Anakin Skywalker. All of this and so much more can be found at Andrew�s Toyz! The clones keep coming! The pack-in poster from the Clone 4-packs and the Clean White Clones are todays addition to the OTC Visual Guide. Head on over to the OTC Visual Guide and check them out or just click the images below! 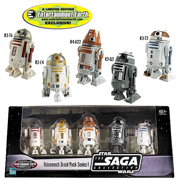 Entertainment Earth has their Astromech Droid 5-packs up for pre-order! The first pack includes R3-T6, R3-T2, R2-C4, R4-A22 & R2-Q2 and the second pack includes R3-Y2, R2-M5, R2-A6, R4-E1 & R2-X2. Check them out and place your order by clicking the images below! Star Force Events - "Rebel Scum"
The folks at Star Force events have set up a unique opportunity for you to to meet Barrie Holland, that way snide Imperial Officer Lieutenant Renz who points his blaster at Han Solo and says "You Rebel scum". The Rebel Scum Event will be a unique opportunity for 60 fans to meet up with him and score his autograph. Also included in the package will be a viewing of Return of the Jedi - Special Edition in Cinedream together and end with a grand finale: a wonderful 4-course meal in the top restaurant De Zoute Deugeniet! So stop on by the Star Force website and reserve your seats today! Long time forum member, and a contributor to our vintage MOC visual guide, Rik Biel sends in his awesome collection. He has a nice C-3PO focus and one of the best custom vintage action figure displays i've seen. But, don't take my word for it, head on over and check out his collection for yourself! And, don't forget to send us your collection and you will be automatically entered in the August contest for a chance to win a signed Kenny Baker photo from ROTS! Andrew�s Toyz just listed the Princess Leia in Boushh Disguise mini-bust for pre-order. This awesome mini-bust from Gentle Giant features interchangeable heads - one head wearing helmet and one without helmet. This is one hot item so head on over to place your pre-order now before they are all sold out. It's due to ship on Aug. 12 so you'll be sure to be among the first to add this to your collection! More Clones! Well, OK, so they are from Episode II, but they are still really cool! Thanks to Entertainment Earth we got the army builders we had always been waiting for and now the first troupe of Clones is added to the OTC Visual Guide. This group sports a bunch of Officers that have seen their days in battle...click the thumbnails below to take a closer look! No milk chocolate inside these fun candy looking action figures! One of the more unique tie-ins to the Star Wars universe was with M&Ms this year...and along with it a bunch of cool collectibles including the Galactic Heroe scale M-Pirefigures below. You'll get 17 figures in all in 2 waves...click the images below to check out the 1st wave! And, don't forget, if you are looking for that not melt in your hand action figure...Alliance Collectibles is the store to shop at! Early Bird Figures have found their way to an eBay auction today and that should mean that they will be on their way to your house soon. To check out the packaging and the figures take a look at this auction here!! ToyJoe.com has sent in some cool images of the new TIE fighter with larger wings, and boy are they big...the ship also looks liek it will come with a TIE-Fighter Pilot Pack in to try to fill those wings. The ship comes with the standard opening cockpit and blast away wings. Take a closer look by clicking the images below. Toy Fellas has two great new things arriving tomorrow August 3rd and will ship the ASAP when they arrive! Also In Stock Family Guy Series 3 Figures $11.99 each & Comic Con Exclusive Leia $35.99 guaranteed mint ship in a protective case. Star Wars IG-88 Mini Bust price reduce to $29.99 & We have marked down many of our LOTR Figures to $4.00 as well as the Pelennor Fields Gift Pack only $19.99. Please be sure to have a good look around! That's right...Star Wars: Episode III Revenge of the Sith DVD is now up for pre-order over at the Star Wars Shop!! And..while you are there, don't forget to pick up your copy of Star Wars Battlefront II...it even comes with a free t-shirt! All right...the last of the Force Battlers that have been released to date have been added to the Young Kids Toys Visual Guide. Anakin Skywalker comes with a whole bunch of accessories for his mechanical arm while General Grievous is equipped with a firing grappling hook and slide! Click the thumbnails below for a closer look and head on over to Alliance Collectibles to order your Force Battlers. Today we are opening the Jedi Temple Research Droids Reviews Section of the site with reviews from our newest staff member Sal! Hop on over to check out his review of RCommander Bacara! Look for a thread in the Toy Line part of the forums that the toy is from. For instance I'll post a thread in the ROTS section for Commander Bacara. From there we can discuss the figure. This is the place if you disagree with my review to post it. Don't worry, I've got thick enough skin, ha ha. Beside, I rather like debating points of interest. All I ask is you just have fun! These are after all just toys we are talking about. JTA Welcomes Sal to the Staff! Feel free to chat with me in the forum. You can find me often in the Sports, ROTS and Customs threads. I look forward to helping out with the Visual Guides. I'm a graphic designer by trade so this site is a perfect fit for me. The latest update in the JTA Collector's Room comes all the way from Turkey! Darth Serjean send us in his collection and is now entered into this month's contest for a Kenny Baker autographed ROTS photo! Would you like a shot at the big prize? All you have to do is send us your collection by e-mailing them to collections@jeditemplearchives.com! This months contest is for a signed photograph of R2-D2 from Revenge of the Sith signed by one of only 2 actors that played in all 6 movies of the Star Wars saga...Kenny Baker!! Here's the deal for this month and it can't get any easier than this...We recently gave our Collector's Room a whole new look and we would like to invite you to add your collection to the site! Just send in photos of your pride and joy of a Star Wars collection (or send us updated photos) and you are entered into the random draw for Kenny Bakers autograph! It's as easy as that! Send in photos of your collection and enter this months contest by e-mailing your collection photos to collections@jeditemplearchives.com! Visual Guide Update - Bust-Ups! Yeah...you know this guy...He's Jango Fett, dad of the most feared bounty hunter in the galaxy, but he's not the best because we went out, hunted him down captured him and threw him in our Gentle Giant Visual Guide for safe keeping. He thought hiding out in San Diego in a silver disguise would give us the runaround...he was wrong. A few more Force Battlers have been added to the Young Kids Toys Visual Guide. Mace Windu complete with battle shield, blaster and lightsaber has been added along with the devoted Republic Clone Trooper! Click the thumbnails below for a closer look and head on over to Alliance Collectibles to order your Force Battlers. Be on the lookout for new ROTS candy hitting the stores shelves. These were found this weekend at Wal-Mart in the candy section. New "Defeat The Dark Side" Milky Way and 3 Musketeers bite-size bags of candy are starting to arrive. These look to be the beginnings of Halloween goodies beginning to trickle in! The candy wrappers are glow in the dark which reveal hidden messages of the dark and light side of The Force. Store packaging collectors might want to keep an eye out for the boxes that the bags are displayed in, such as this one for Milky Way that I picked up! Cool art, and a nice box to fill up with your collectibles when it's emptied!